The 2nd Generation Nest Protect is the best combination smoke and CO2 detector money can buy. It's price can be tough to stomach, but it's features and compatibility more than make up for it. The smoke detector is an overlooked part of our home. We typically grab the first thing we find at the hardware store, mount it to the wall, and forget about it till it starts chirping. Much of that is due to the smoke detector industry being light on innovation over the years. Sure the detection technology has improved, but just about everything else has remained the same. That’s where Nest steps in. They saw an industry that was stale and decided to light a spark. And with that came the Nest Protect Smoke and CO2 Detector. The first thing you’ll be drawn to is the price. A $120 smoke detector seemed absurd when combination smoke/CO2 alarms can be had for $30. But the deeper you dig inside the features of this innovative device, the more it makes sense. It’s mix of quality detection, wireless communication, and integration into other smart products make it perfect for the modern home. When it comes to improving on the design of your traditional smoke alarm, it doesn’t take much. Nest does away with the ugly beige circle for a chic square with rounded edges. The white cover is made of stainless steel and features a mesh design which seems to be more inviting for detecting smoke and carbon monoxide. At the center of each Nest Protect is a circular LED that provides information. A green ring lets you know everything is fine, an orange light cautions you that there may be danger, and red lets you know it’s time to get out. A motion sensor will also allow for the detector to light up when triggered in a feature they call Pathlight. This can help illuminate a dark staircase or hallway a bit. Pathlight can be turned off in the settings. Installing the Nest Protect was incredibly simple. The alarm comes in a wired or battery-powered model depending on your home’s setup (we tested the battery model). It secures to the wall the same way a traditional smoke detector would and connecting to to it through the Nest app took a couple minutes. It’s the same app you use for other Nest products such as their learning thermostat, security camera, or doorbell (we’ll get to integration with these later). The battery-powered model requires 6 AAA lithium batteries while the wired model takes 3. Nest claims battery life is 5 years. The Nest Protect uses a split-spectrum sensor to detect fires. It works first and foremost like a photoelectric alarm. This technology uses infrared wavelengths to look for large particles in the air. These are present in smoldering fires that are slow to develop but more common. For fast developing fires, the Nest Protect uses a different infrared wavelength to look for small particles in the air. This is the type of smoke that you’ve probably dealt with when you’ve burnt something on the stove. While sniffing out these kinds of fires are the job of ionization alarms, the Nest Protect is technically not classified as one. This was a decision by their engineers due ionization technology’s prevalence for nuisance alarms and need for radioactive particles to detect smoke. But the split-spectrum sensor is supposed to act in the same manner as an ionization detector without the false alarms. As you might guess, we weren’t able to set fire to our home to test out the Nest Protect. We did however use smoke matches to trigger the alarm. It detected the smoke and gave a clear warning about the event without an issue. Perhaps the most exciting part about testing was unearthing new features as we went along. The most important one is the ability for multiple Nest Protects to communicate with one another during an event. Now not only does the alarm connect to your home’s WiFi, but also connects individually to each other through a protocol called Weave. That means that even if your internet is knocked out, your Nest Protects will still be talking to one another. The Nest Protect looks like an ordinary smoke detector. The importance of all your smoke alarms going off when one is triggered is incredibly important. And using that wireless connection makes the Nest Protect an even safer option than smoke alarms that are wired together (which can get damaged in a fire). It also gives people in older homes that don’t have wired smoke alarms a cheaper option than hiring an electrician. That feature alone is worth the high price tag in our opinion. One other nice touch is that you can label each Nest Protect in the app. So when the alarms do go off, the voice will tell you not only what the alarm is for, but what room the event is taking place in. This helps you decide what your next course of action is. There are also some little features that added to it’s value. The Protect can track both temperature and humidity in the room and send alerts when they pass specified thresholds. The detector will schedule a monthly test and notify you beforehand. When an alarm is triggered, it will notify you through it’s app and allow you to turn it off from your phone. Nest has even includes a warning when batteries are getting low. The only thing that felt missing was having Google Assistant built-in. 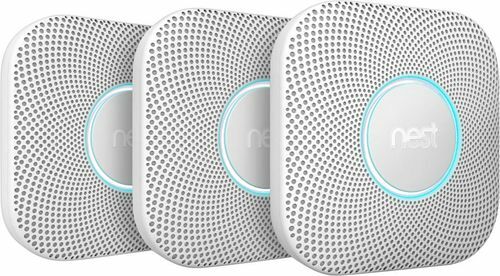 First Alert OneLink recently released with Amazon Alexa built-in, so you have to wonder if the 3rd Generation Nest Protect might find a way to make that happen. Nest has prided itself on it’s products compatibility and the Protect alarm doesn’t disappoint. For current owners of the Nest Cam (or DropCam), the camera can be set to record when a smoke or CO2 alarm is triggered. It will proceed to e-mail you the clip. Nest Learning Thermostat owners can also connect and have it automatically turn off the furnace which is a helpful safety feature. Both Philips Hue and LIFX are compatible and provide special lighting during an alarm. We setup a LIFX mini color bulb to strobe red when the alarm would go off. There was about a 45 second delay between alarm and lights going on, but it worked. This seems like a great idea for those who are hearing impaired. Both the WeMo Mini and TP-Link smart plug can be triggered to turn on an outlet. There is compatibility with evoHome, Lutron, Honeywell, Wink, and others. Even IFTTT is loaded with actions. There’s hundreds of ways to make your home react to specific events. We were disappointed that Google Home products (such as the Google Home Mini) couldn’t connect to provide an speaker. Hopefully that’s something that’s added down the road. We were a little skeptical about a $120 alarm, but the Nest Protect lived up to the hype. It provided everything you could ask for out of an alarm and we had a hard time finding any flaws outside the price. For modern homes that are already hardwired, you probably wouldn’t get the full value out of this. But for those who don’t, the Nest Protect is actually a more affordable option than hiring an electrician. 3-packs are sold at a nice discount and for a few hundred dollars you can have your home set for the next 10 years. Overall this is the best combination smoke alarm and carbon monoxide detector on the market. If you can stomach the price, you won’t be disappointed.